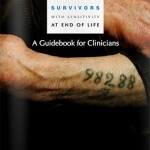 Do Holocaust Survivors have different end-of-life care needs? When providing end -of-life care services to Holocaust Survivors, it is important that we are mindful of our words and actions—particularly because we may be the last generation of caregivers who have the honor, as well as the moral obligation, of delivering compassionate end-of- life care to Survivors. Identify them early. Ask simple questions to identify where they are from. Clues include place and date of birth, date of immigration to the Unites States, religion and languages spoken. Communicate. How you communicate is often more powerful than what you say. Use empathetic statements – let the Survivors feel understood, emotionally supported and, most of all, safe. Acknowledge that they are being heard. Speak calmly and with kindness. Beware of triggers. Holocaust Survivors at the end of life may respond and react differently to everyday activities, sounds and experiences. Triggers include harsh chemical smells, surgery-related identification bracelets, clinically necessary shaving and the use of nebulizer and oxygen masks. All these may be symbols of past losses of dignity and individuality/personhood or the threat of being administered deadly gas. Recognize the signs. Your loved ones may experience terrifying flashbacks during waking hours and nightmares at night or they may start to withdraw from relationships and activities that might otherwise have been sources of solace. Hypervigilance and intrusive or micro-managerial behavior patterns may also surface.